수정전은 근정전 서측에 있는 건물로써, 북쪽으로는 경회루가 자리 잡고 있다. 수정전이 있는 권역은 세종 연간에는 학문을 연구하며, 왕에게 주요 정책을 자문하고 건의하던 기관으로 한글을 창제하는 등 문치의 본산이었던 집현전이 있던 궐내각사의 지역에 해당하며, 동쪽으로 사정전의 왕의 영역과 신하들의 영역이 만나는 접점인 이곳에 궐내의 관청인 각사들이 자리 잡고 있다. 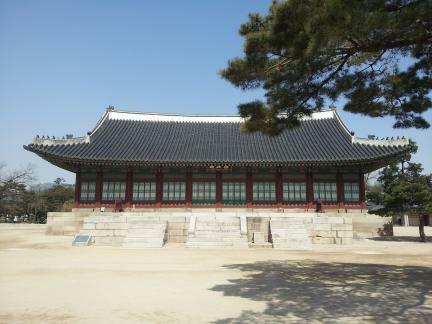 수정전은 고종 때 중건되어 잠시 왕의 편전으로도 사용되었으며, 1894년 갑오개혁 때에는 대한제국의 군국기무처를 여기에 두고, 이후 내각청사로 사용되었다. 4면에는 행각과 남쪽의 외행각이 일곽을 형성하고 있었지만, 일제 때 훼철되고 현재는 본건물인 수정전만 남아있다. 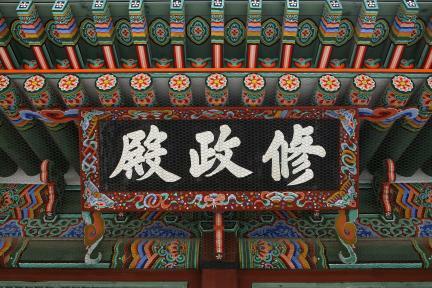 현재의 건물은 고종 4년(1867)에 근정전, 사정전, 경회루 등과 함께 중건되었다. 중건 당시에는 4면의 행각과 남쪽으로 외행각이 있었으나, 일제시대를 거치면서 내부 벽체와 창호가 훼철되었고, 그 일곽 또한 1915년 가을에 조선총독부를 세우고자 하는 일제의 전초작업으로 시정 5주년 기념 사업인 조선물산공진회를 경복궁에서 개최하면서 모두 헐리고 현재에 이르고 있다. 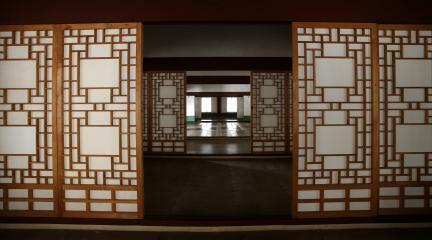 ‘수정’이란 의미는 ‘정사를 잘 수행함’이란 의미로 현판글씨는 중건 당시 조석원이 썼으며, 조선 후기 문신으로 도승지에까지 이르렀으며, 글씨에 조예가 깊었다. 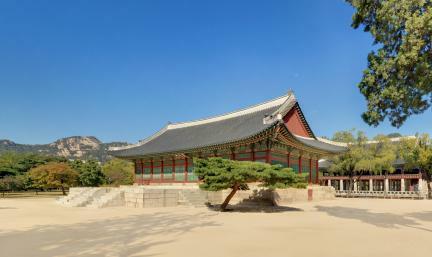 조선시대 후기의 문헌인 궁궐지에는 수정전과 이에 부속된 행각의 명칭, 규모, 양식, 주칸 등이 비교적 소상히 기록되어 있으며, 정면 10칸, 측면 4칸의 비교적 긴 장대한 건물로 남향으로 앉혀진 1고주 7량가의 이익공양식 단층 팔작지붕이다. 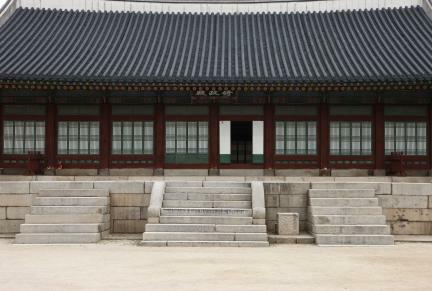 수정전 정면에는 네 벌대의 넓은 월대가 조성되어 있다. 월대에는 정면에 계단을 3곳 설치하였고, 중앙의 계단은 소맷돌을 두어 좌우계단과 차별화시켰으며, 이것은 임금의 출입이 자주 있는 편전임을 의미한다. 다섯 벌대나 되는 높은 건물기단 위에는 4각 초석위에 각기둥을 세우고 띠살창 분합문과 빗살창교창을 사방 전면으로 둘러 설치하였다. 높은 기단의 좌우 측면에는 불을 넣는 아궁이를 설치하여 온돌방을 두었다. 평면은 정면10칸·측면4칸으로 앞면 퇴칸 주간을 넓게 하여 10칸의 도리방향을 모두 대청으로 터져있으며 좌우 및 후면의 퇴칸이 연결되어 내부 회랑 역할을 한다. 공포는 길게 뻗은 쇠서의 이익공 위에 소로를 높고 양봉한 보머리를 받으며 주심도리를 받아준다. 지붕의 용마루 및 내림마루엔 양성을 하고 취두·잡상을 배열했다. 건물의 짜임이 견고하고 창의력있는 구조다. 수정전은 외관, 가구부재 등 전반적으로 양호한 상태로 중건 당시의 모습이 잘 유지되어 있다. 수정전은 근정전 서편의 궐내각사에서 유일하게 남아있는 건물로 역사적, 건축적 가치가 높다. 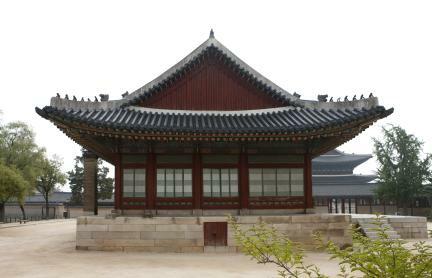 Sujeongjeon Hall, located to the west of Geunjeongjeon Hall and to the south of Gyeonghoeru Pavilion, is assumed to be the site where Gwollaegaksa was originally situated. 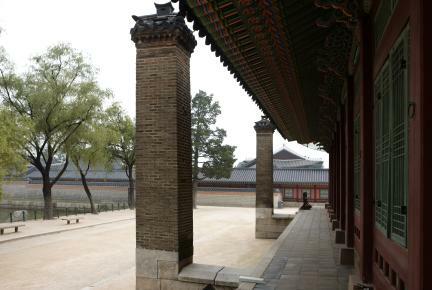 Gwollaegaksa refers to the complex of government offices in the palace, and includes Jiphyeonjeon (Hall of Worthies) which was established during the early Joseon Period. 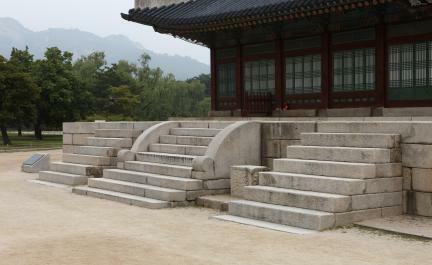 Jiphyeonjeon consisted of a body of scholars who engaged in academic research and provided counseling for the kings about major national policies. 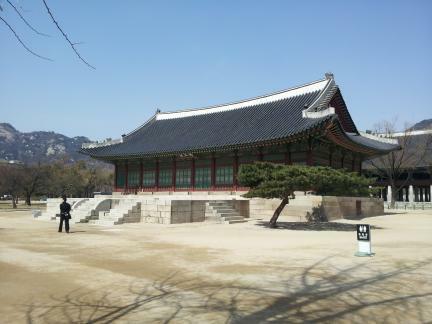 It was especially renowned for the compilation of Hangeul (Korean alphabet) during the reign of King Sejong. 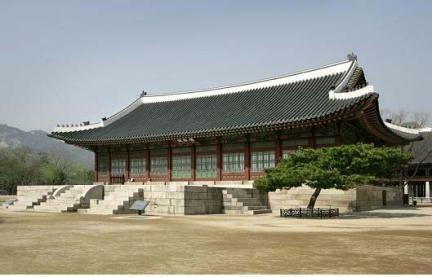 The current building of Sujeongjeon Hall was restored in 1867 (the 4th year of King Gojong’s reign) along with Geunjeongjeon Hall, Sajeongjeon Hall, and Gyeonghoeru Pavilion, and was used as the king’s office for a while. 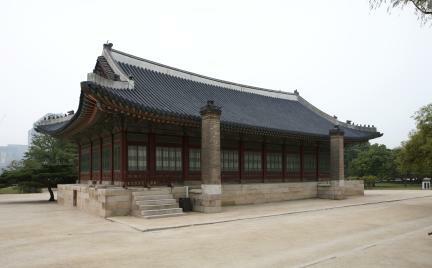 After the Gabo Reform in 1894, Gunguk Gimucheo (Deliberative Council) and the cabinet were housed in this hall. 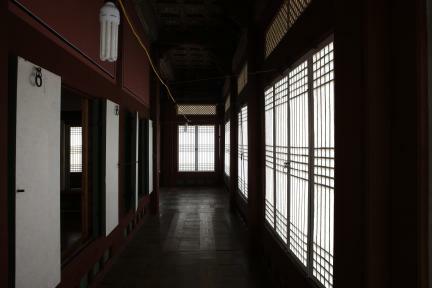 The hall was originally surrounded by cloisters, but they were demolished during the Japanese Colonial Period. 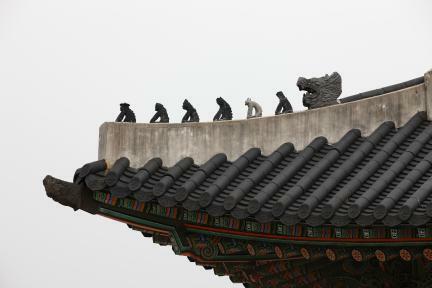 ‘Sujeong’ means ‘to properly conduct political affairs.’ The Chinese characters on the wooden name board were written by Jo Seok-won, a civil official of the late Joseon Period, at the time of the building’s restoration. 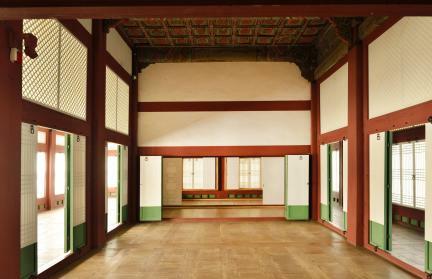 Sujeongjeon Hall has great historical and architectural value as it is the only remaining building at the Gwollaegaksa site, and its overall appearance as it was upon completion of the restoration work has been well preserved.